It’s getting late in the year and there are hardly any releases that I’m looking forward to hear coming out this year (one notable exception is the newest from the Japanese legend SIGH). But as it often happens there is a wild-card entry into the game and some album pops out that stands out to me among all the year’s releases (yes I am opinionated and I do make those “album of the year lists”). Last year I was pretty blown away by a fairly unknown Dutch band MORVIGOR, and now accidentally an also fairly unknown Danish band ALKYMIST – although I‘ve registered a bit of a hype going on around them – is a serious contender for my TOP 10 AOTY. I see it as a good sign when it is not immediately obvious what sub-genre (or sub-sub-genre depending on how you slice it), especially if we’re talking about a young – or newly formed – band that hasn’t been of some particular music scene back in the olden days. Predictability is the death of the soul. ALKYMIST are described as Progressive Sludge/Doom, and indeed they don’t make paint by the numbers music. The self-titled debut has five songs on it, ranging from circa five and a half minutes to almost eleven minutes. As is apparent from the length the songs can be pretty dynamic and have some compositional shifts. Most of the riffs on the album are those super heavy Sludge/Doom riffs that drive the listener into the ground, but there are subdued moments with a bit Gothic atmosphere and vocal style that remind me of Tom G. Warrior and his project TRIPTYKON. In the harsher parts the singer Peter Bjørneg has a style similar to Kirk Windstein of CROWBAR or Scott Kelly of NEUROSIS – his commanding vocals are one thing that really sell the album to me. 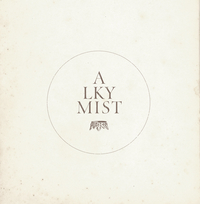 ALKYMIST are not reinventing the wheel with but the music is very soulful and full of interesting ideas – a trippy instrumental sections, buildups or changes in atmosphere; the songs are dynamic and full of memorable vocal and guitar melodies massive, dirty riffs. Overall the sound is really versatile and mature, one can tell that it is a result of a long immersion into song and riff writing. I like this album cover to cover, it is hard to talk about favorite songs, because every song is interesting and has its stand-out moments. It’s the kind of album that is easy for me to fall in love with and get hooked on it. As I’ve mentioned above the band has some reputation preceding them, but it is totally deserved. I can whole-heartedly recommend this one.